397 pages | 36 B/W Illus. "Written by experts from academia, industries, and regulatory agency, this is an update of a comprehensive review of the generic oral solid drug product development process. It presents various aspects of generic drug product development with formulation development through to post-approval changes. This edition includes a new chapter on the U.S. Pharmacopeial Convention and its role in harmonization. 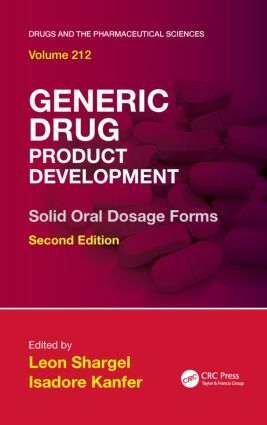 … This book will be a standard reference for everyone working on or studying generic drug product development, in industry, academia, and regulatory agency." "This text would be most useful for industry and regulatory professionals, but it would also provide a good reference text for pharmacy students wanting to become familiar with the considerations of generic drug development." Isadore Kanfer, PhD is Professor and Emeritus Dean of Pharmacy, and former Head of Pharmacy and Dean of the Faculty (1999–2007), Rhodes University, Grahamstown, South Africa. Dr. Kanfer has been a visiting professor at the University of California-San Francisco and the University of North Carolina School of Pharmacy, Chapel Hill. He spent several years in the pharmaceutical industry in Canada and has written or contributed to several book chapters and more than 200 research publications and conference presentations. Dr. Kanfer received his B.Sc. in pharmacy and Ph.D. in pharmaceutics from Rhodes University, Grahamstown, South Africa.